nothing to write home about. 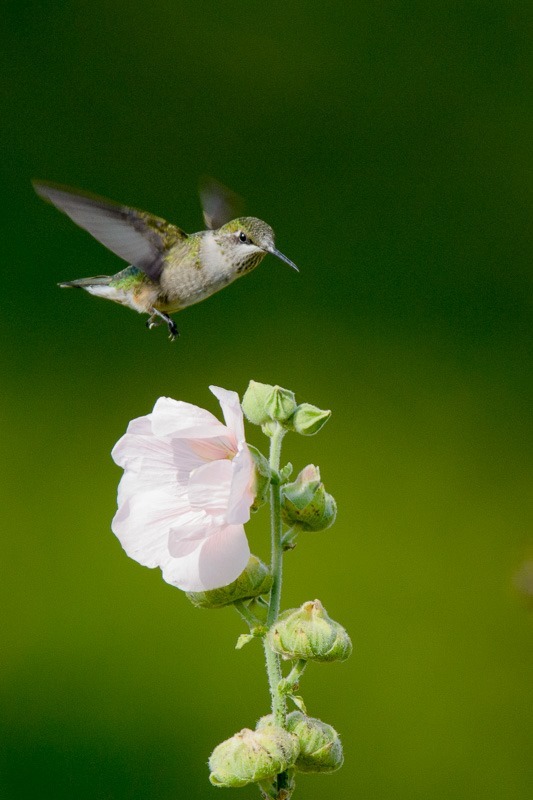 The Ruby Throated Hummingbird is the only species that visits Manitoba, so there was no problem identifying them. 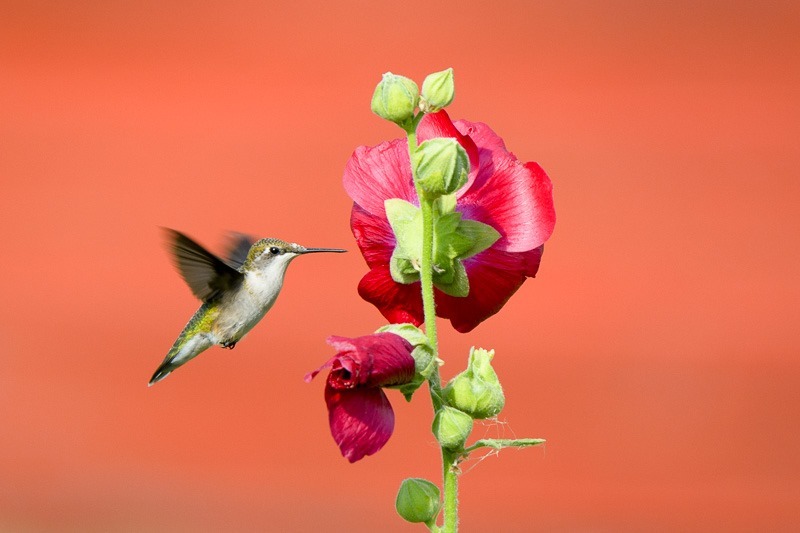 I thought I had the most unique pictures of hummingbirds against a purple flower called Bee Balm. Then I went to post the pictures online and found out that most of the photographers of Winnipeg had shot the same birds in the exact same place. A few variations in the flowers was all that transpired from all the pictures. I decided that I needed to get a different type of picture. But that was easier said than done. 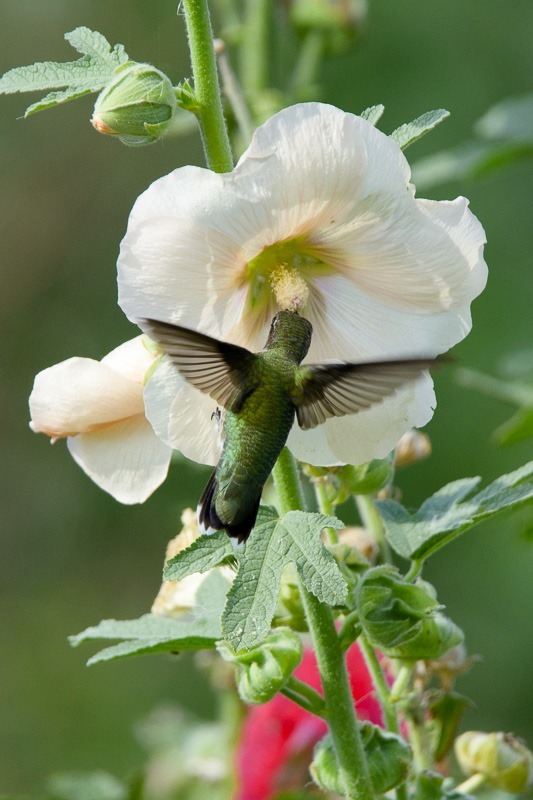 Where to find a decent set of flowers that are of great interest to hummingbirds? There was no question that I would shoot them with some plastic feeders in the frame. Shooting anywhere else than while feeding is a very different proposition. Still, I didn’t want those feeders in sight. All had to be natural. After a long time, I came across a private property, where I could shoot with permission of the owner. The hummingbirds in there were just crazy. Humming around my head at times, they simply didn’t care if I was there or not. All the better for me. At first they checked me out, probably to see if I wasn’t a bearer of nectar. When they decided I was of no interest, they ignored me completely. 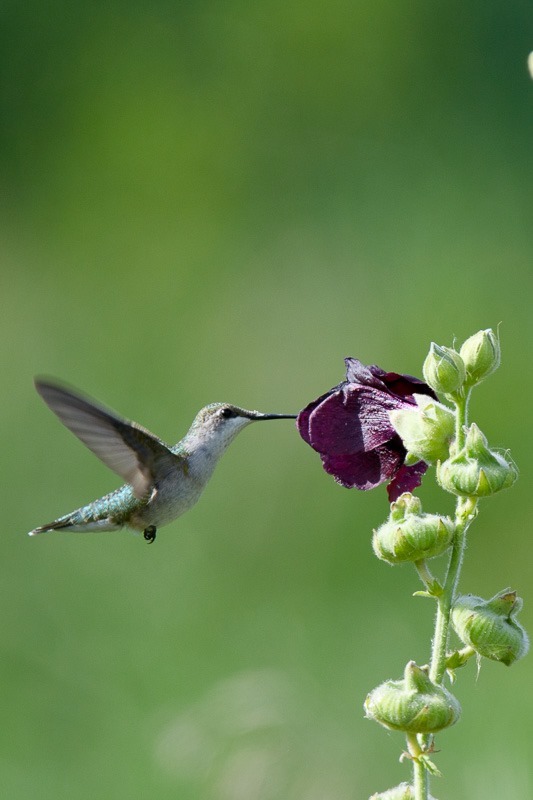 Hollyhocks were the nectar choice of the day. They were coming and going by waves, at times there were more than 25 of them feeding off the flowers, and the next moment they were all gone. A most amazing experience . The birds were so confident that shooting them became fairly easy. Here is one checking me out, looking straight at the camera. Other birds were there too, some who had normally no use for these flowers. 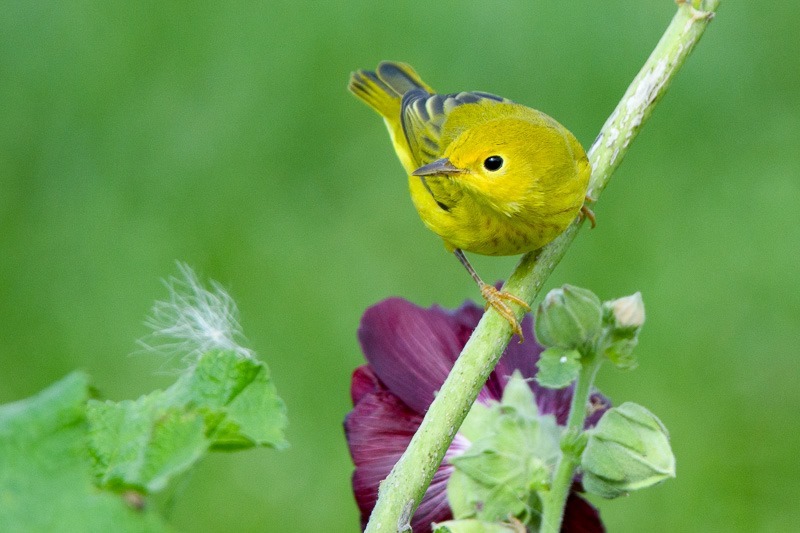 This Yellow Warbler was thinking of getting some food off the flowers as well. Take a good look at the (out of focus) insect in the bottom left of the picture. Two seconds after this picture was shot, the insect had become food. The hummingbirds were the main interest of this visit, though. I came prepared with a long lens and a tripod. Shooting fast moving birds with a camera on a tripod seems counter-intuitive, I agree. But the fact that most of the camera is stable when you rotate the lens in any direction is a big plus for successful shots. Of course the ballhead on the tripod is mostly loose and rotating the camera is very easy. Applying a little force on the foot that holds the lens blocks the setup and the shot is then stable. Choosing the right subject turned out to be the challenge. There were so many birds humming around my ears that by times it was impossible to get the right bird in the right frame . Shooting with a long lens at fairly close quarters also made for very nice, creamy backgrounds. One would never guess that the red background in one of these pictures is a flaky red painted barn that has seen better days. Long ago . 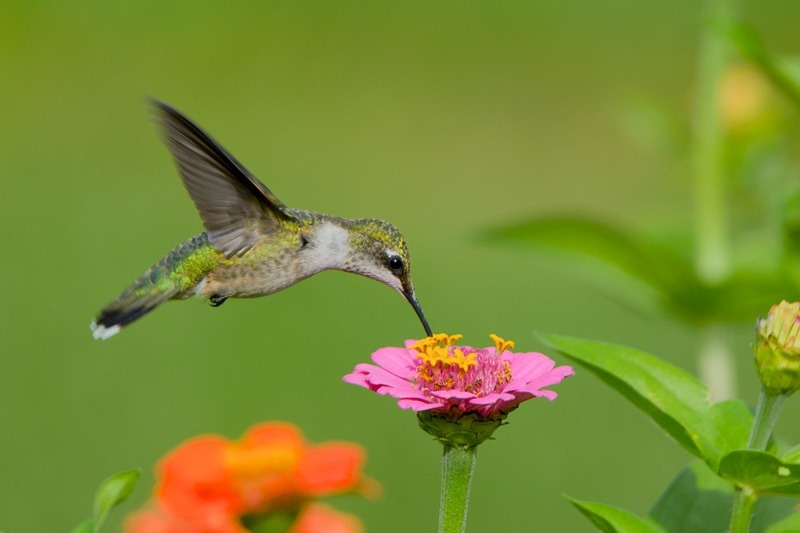 Hummingbirds like nectar, they need nectar. It is hard to grasp that these tiny birds will start a trek south of a few thousand miles to stay warm during our winter. I can’t imagine myself walking thousands of miles in a year, let alone in a few weeks. These birds don’t even think twice about it! What is even better for me? They will be back next year, giving us another shot at photographing them. So you may ask about the lead picture of this post. What about a Red Tailed Hawk in a post for hummingbirds? 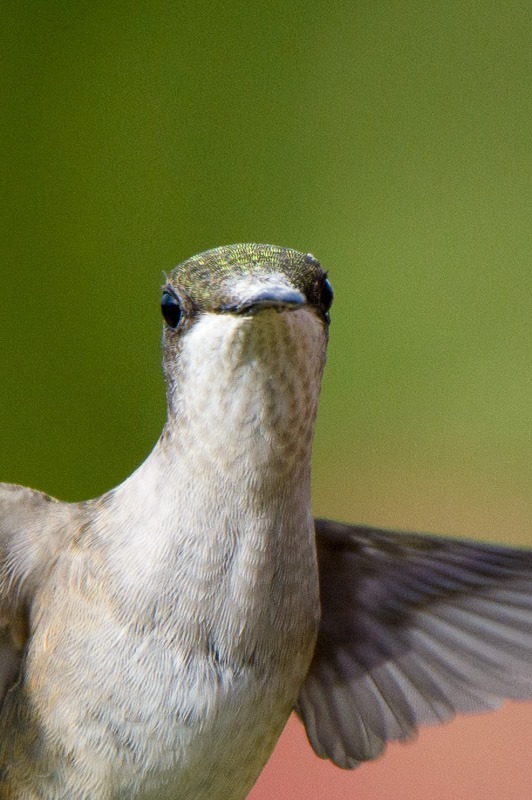 Well, scientists have proven that hummingbirds are too tiny to be of interest to the hawk. However, other birds are. 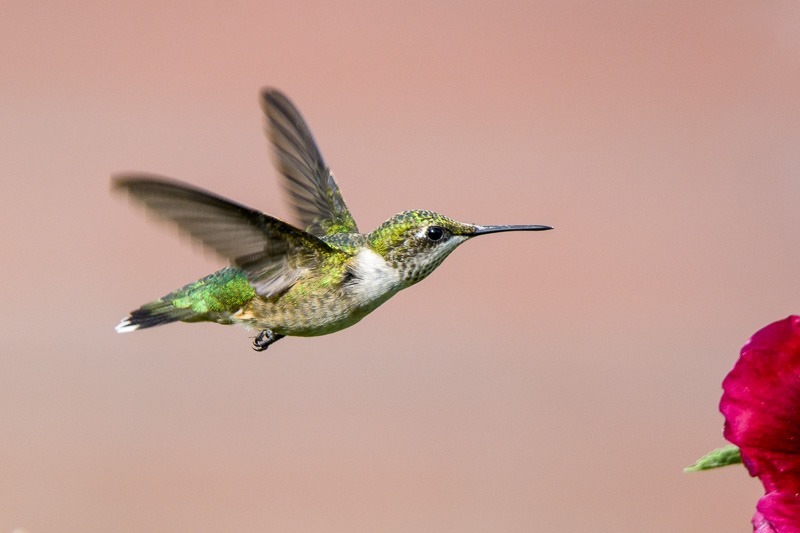 Hummingbirds nesting underneath a Hawk’s nest have a lot more chance to survival this way. 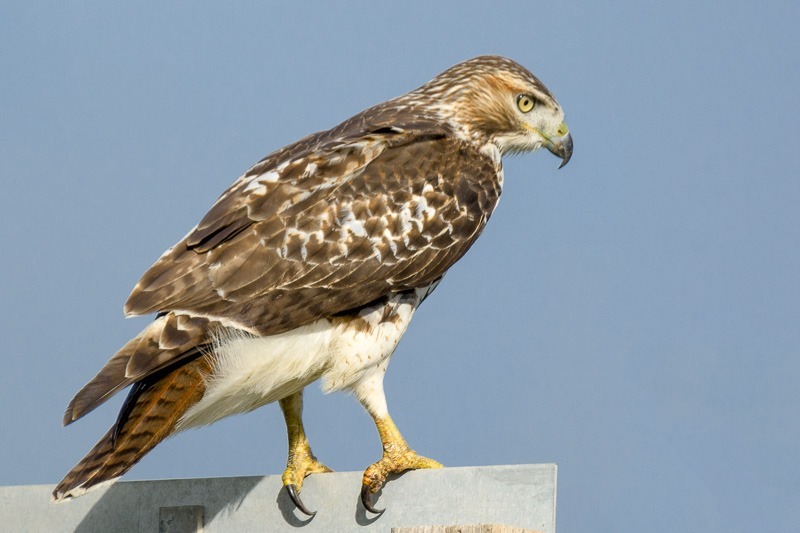 The hawk will clear out any predators that are interested in the hummingbirds, leaving the hummingbirds alone in the process. So not only are they fast and furious, they are intelligent as well. 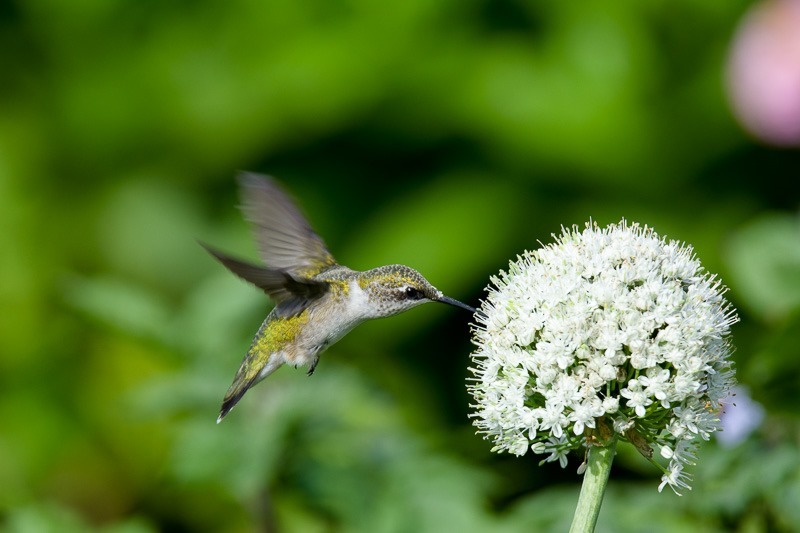 Oh, and this year I managed to shoot hummingbirds without a single purple Bee Balm flower in sight .